Garden Safe® Brand Bt Worm & Caterpillar Killer is an easy-to-mix liquid concentrate that kills worms and caterpillar stage insects but has no effect on birds, earthworms or beneficial insects such as honeybees and ladybugs when used as directed. *The percent active ingredient does not indicate product performance, and potency measurements are not federally standardized. It is a violation of Federal law to use this product in a manner inconsistent with its labeling. For outdoor use around the home and garden only. 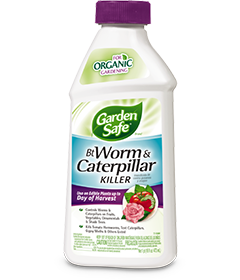 Apply Garden Safe® Brand Bt Worm & Caterpillar Killer when worms or caterpillars are first noticed, then repeat at five- to seven-day intervals while they are active. Apply more frequently to control heavy infestations. Apply thoroughly to top and bottom of foliage. Repeat after heavy rains. This product must be eaten by worms or caterpillars to be effective. After ingesting the insecticide, they immediately stop feeding, though they may appear to be otherwise unaffected for several days. Best results are obtained when worms are small; they must be actively feeding on treated, exposed foliage. You may apply this product up to the day of harvest. Shake well before use. Partially fill sprayer with water before adding the required amount of product. After product has been added to the sprayer, mix thoroughly before adding remaining water. Spray top and bottom leaf surfaces thoroughly. Shake sprayer often while spraying to keep spray solution thoroughly mixed. Use all of the spray mixture within 24 hours of mixing. lettuce, melons, mustard greens, tomatoes and turnip greens. Also kills imported cabbage worm on broccoli, cabbage, cauliflower, collards, kale, mustard greens and turnip greens as well as tomato hornworm on tomatoes. Shade Trees and Ornamentals: Mix 2 fl oz per 3 gal of water (4 tsp per gallon) for a hand sprayer or proportional amounts for a hose-end sprayer following manufacturer’s directions. Apply at first sign of infestation and repeat at weekly intervals when needed to maintain control. Apply to thoroughly cover all foliage surfaces of shade trees and ornamentals for control of the following leaf-eating worms: Bagworm, fall cankerworm, tent caterpillar, fall webworm, spring cankerworm, gypsy moth** and elm spanworm. **Apply when buds swell but before leaves are fully open. If eggs hatch over a long period of time or if reinfestation occurs, spray about 14 days after first application. Pesticide Storage: Store in a cool place. Activity may be impaired by storage at temperatures above 90ºF. If empty: Nonrefillable container. Do not reuse this container. Place in trash or offer for recycling if available. CAUTION. Causes moderate eye irritation. Avoid contact with eyes or clothing. Avoid breathing vapors or spray mist. Wash thoroughly with soap and water after handling. Have the product container or label with you when calling a Poison Control Center or doctor or when going for treatment. To protect the environment, do not allow pesticide to enter or run off into storm drains, drainage ditches, gutters or surface waters. Applying this product in calm weather when rain is not predicted for the next 24 hours will help ensure that wind or rain does not blow or wash pesticide off the treatment area. Rinsing application equipment over the treated area will help avoid runoff to water bodies or drainage systems.